In the countryside, Anne Trulove and Tom Rakewell celebrate their love. 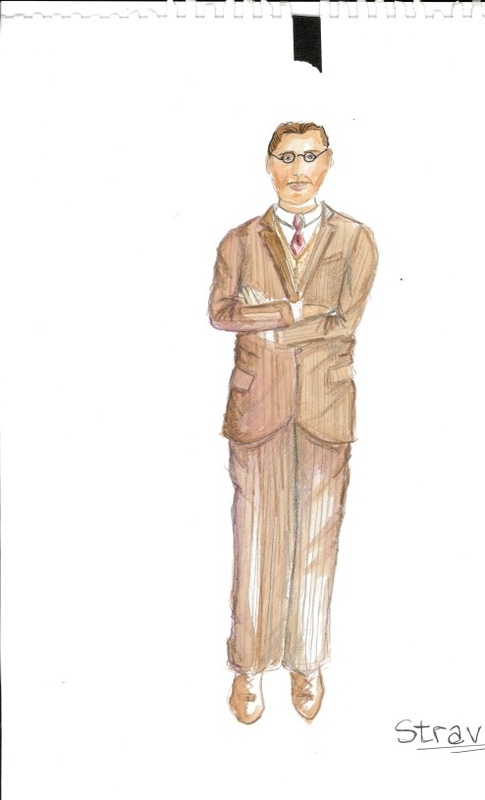 Nick Shadow appears with news that Tom has inherited a fortune; the two depart for London. In the wicked city, Shadow introduces Tom to Mother Goose’s brothel. Back in the country, Anne decides that she must rescue Tom. Meanwhile, Shadow suggests visiting the amazing bearded woman, Baba the Turk. When Anne arrives, she finds Tom and Baba married. Tom quickly tires of her, so Shadow next proposes a miraculous machine that turns stones into bread. Anne again appears to save Tom, but he and Shadow have disappeared. A year and a day from their first meeting, in a graveyard, Shadow demands his payment—Tom’s soul. But Tom hears Anne’s voice in the distance and his love is reawakened. Shadow, defeated, disappears into the ground. Tom survives, mad, and is shut up in Bedlam. Anne arrives to comfort him, but there is little to be done. Adapted from the synopsis by Boosey & Hawkes. In 1947, Stravinsky visited the Art Institute of Chicago and viewed a series of images by the 18th-century artist William Hogarth, entitled A Rake’s Progress. These eight scenes, which trace the descent of Tom Rakewell from respectability to debauchery and madness, struck him immediately with their dramatic potential. Stravinsky had, since moving to the United States in 1939, been seeking inspiration for an opera to be written in English. AN OPERA ABOUT … OPERA? Stravinsky spent the majority of his career writing in a neoclassical style, and in the duo of W.H. Auden and Chester Kallman, Stravinsky found librettists who shared his affinity for the past—as well as his ability to recreate it with a 20th-century outlook. Few operas harken so deliberately to various operatic forms and conventions. Its characters are broad archetypes, indicated by even their names (Tom Rakewell, Anne Trulove, Nick Shadow). The score and story include nods and explicit references to Mozart (especially Così Fan Tutte and Don Giovanni), Monteverdi’s Orfeo, bel canto opera, the Faust story and its operatic adaptations, the myth of Venus and Adonis, and more. After this triumph of neoclassicism, Stravinsky abruptly changed compositional course, subsequently writing in the style of musical serialism (closely associated with that other 20th-century titan of composition, Arnold Schoenberg). The upcoming BLO production will use The Rake’s Progress to explore this pivotal moment in Stravinsky’s career: the creative team has secured permission from the Stravinsky estate to add the non-singing role of Stravinsky to the opera. The audience will see the character of Stravinsky struggle with his own hunger for fame and acclaim through the story of Tom, who is seduced by worldly riches and loses his way, until Stravinsky can finally set himself free from his past and boldly explore musical experimentation for the rest of his career. Opera was in Stravinsky’s blood—his father was the principal bass at the Mariinsky Theatre in St. Petersburg, Russia. Stravinsky was introduced to his librettist, the poet W.H. Auden, by his neighbor in California, Aldous Huxley—who you might know through his seminal dystopian novel, Brave New World. This article was originally published in the Spring 2017 issue of Coda magazine. 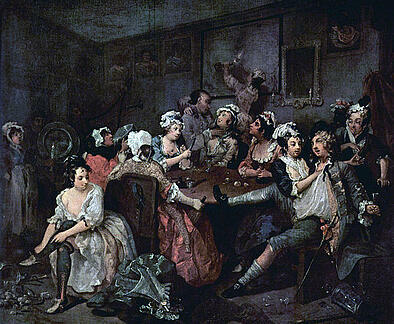 Images: The third panel in A Rake’s Progress series by William Hogarth, depicting a wild night at the Rose Tavern, a famous London brothel in Covent Garden; Costume sketch for the character of Stravinsky in the BLO production, by designer Neil Fortin.